This page is for general support information for the Klipsch Stream series. If you have any questions not answered here, please visit our main Support page. When rebroadcasting a Line In source, you can broadcast up to 4 additional speakers. In Critical Listening mode, audio files in high resolution (24-bit/96 kHz) can be played and rendered accurately to one Play-Fi product with no compression, down-sampling, or network distortion. 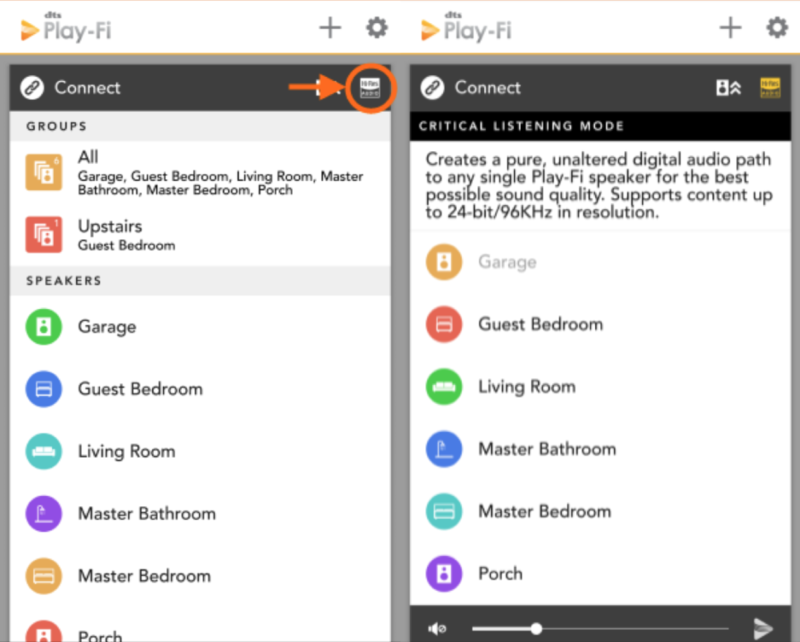 Play-Fi supports streaming different audio to different rooms or zones, directly from your Play-Fi app. So, for example, you can send Pandora downstairs for a dinner party, and keep Radio Disney playing upstairs for the kids. To set up a new zone, simply open up the Play-Fi Control screen by pressing the Play-Fi button in the app. You will see the currently playing Play-Fi products and what they are playing in a Zone module. To add another Zone, simply press the Plus icon in the top right of the screen, which we’ve pointed out for you here. A new Zone module will be created allowing you to pick you Group or individual Play-Fi product, and then you can select your audio source. Once configured, you can press the Play-Fi button to return to the Play-Fi Control screen, where you can easily manage each Zone. You can have up to four zones at once, and each zone can include up to 16 speakers (you can only use 4 speakers when rebroadcasting a Line In). Each zone does have to play from a different music source or server. 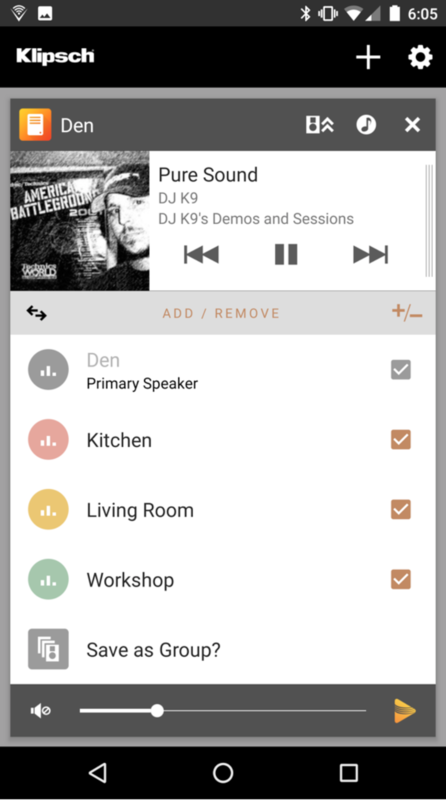 Enabling Critical Listening Mode Before selecting a Play-Fi product, tap the Hi-Res button in the top bar of the zone module. 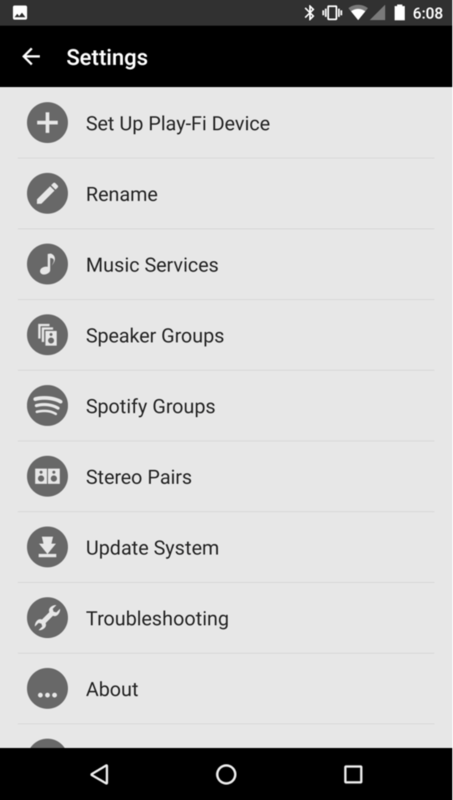 This will change the list to display the Play-Fi products that are compatible with this mode. Most Play-Fi products support Critical Listening, but if you’d like to know more about your product, contact info for your brand may be found on the main Knowledge Base page. 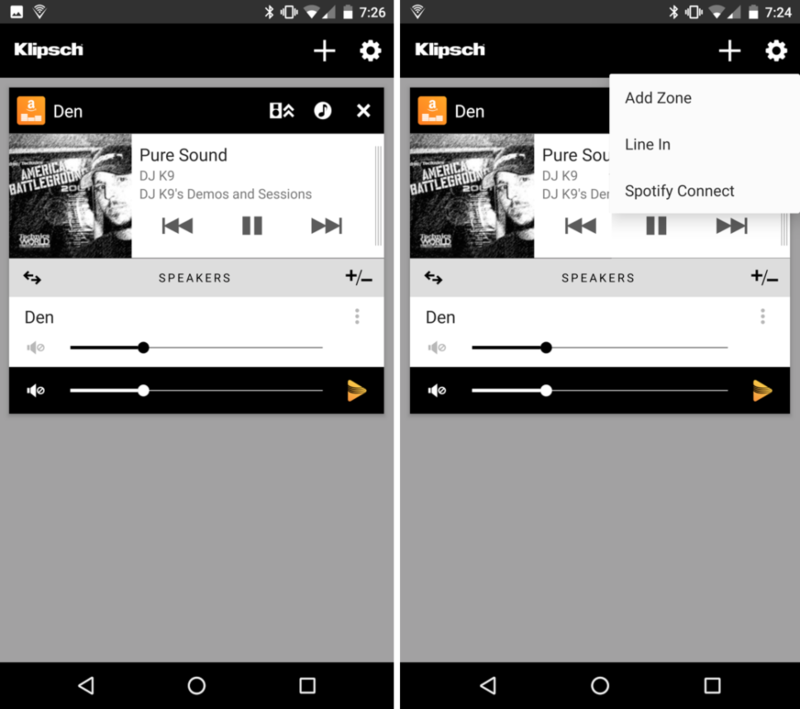 With the Klipsch Stream app you cannot stream video from your device. 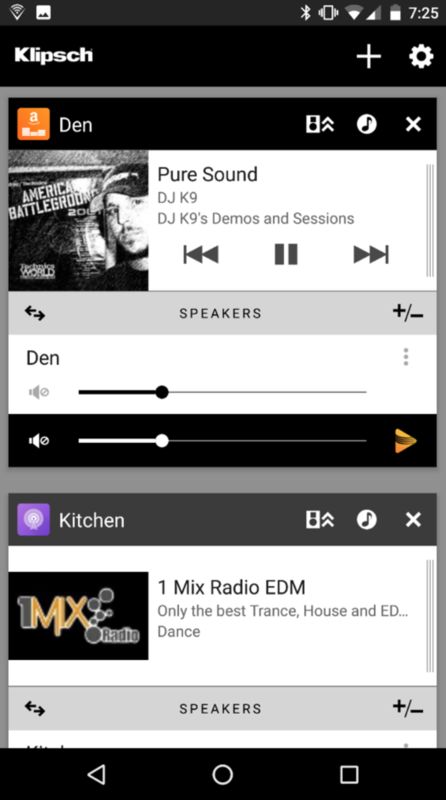 The apps are built to support streaming audio only. There will be a delay to the other speaker because of the time it takes to buffer the signal. We have decided to keep the Video in sync with the Sound Bar so there is no lip sync delay, but the rest of the speakers will be in sync with each other, but will be delayed from the source Sound Bar. The best time to use this feature would be when watching things like sports, where you want to hear what is going on in another room but can’t see the video since it's in another room. In this example, it won’t matter if the audio is in sync with the video. If you use other sources other than HDMI like Optical or Analog, the audio will be delayed to be in sync with the rest of the speakers so it will not be in sync with the video. This would be the best method if you were using a streaming audio service from a TV or set-top or streaming box, for example. What routers are compatible with Klipsch Stream? Please see this PDF for a list of routers that Klipsch has tested with Klipsch Stream products. Please note, this list is not a list of ALL routers that are compatible. Klipsch Stream products are built to deliver a wonderful audio listening experience at home, on a personal Wi-Fi network. Offices and other business-class networks like hotels, airports, and areas with “guest” Wi-Fi networks are almost always set up to disable media streaming products. This is done for security reasons, and to preserve bandwidth. Regardless of the reason, these environments are not suitable for use of your Klipsch Stream products. If for some reason you do need to use your Klipsch Stream products in an office environment, work with your IT department or network administrator on set up. We also have a partial list of Incompatible Network Setups available for download (PDF).